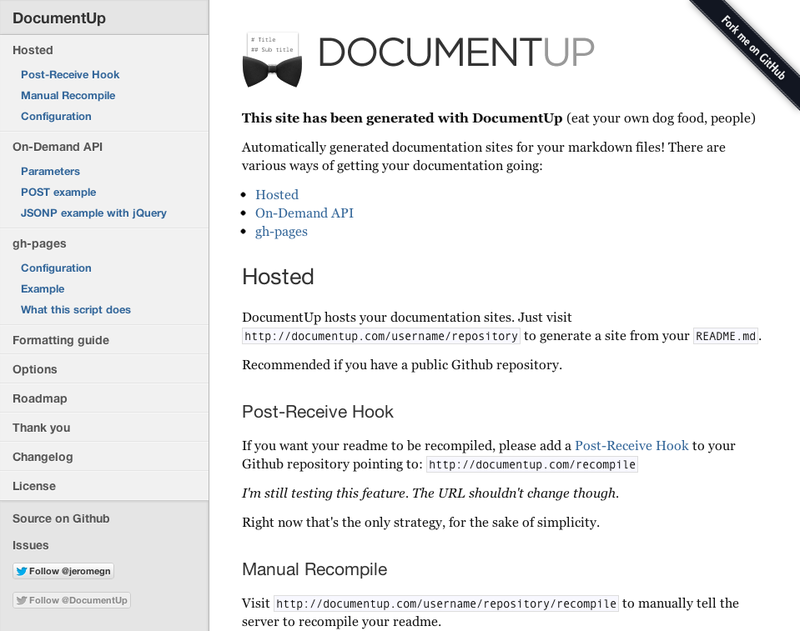 DocumentUp hosts your documentation sites. Just visit http://documentup.com/username/repository to generate a site from your README.md. Recommended if you have a public Github repository. You can point a CNAME to project.username.documentup.com. Visit http://documentup.com/username/repository/__recompile to manually tell the server to recompile your readme. Useful when changes are made to the stylesheets on the server but the compilation hasn't been triggered for a while. Make sure to change the "username/repository" to the repository's name and user's username. Use the documentup.min.js file in this repository, not the one what used to be on cdnjs.com, it's deprecated. DocumentUp.document accepts either a String or an Object representing your desired configuration. If an object is used, remember to add a repo option containing the path "username/repository" to your github repository. All options detailed in the options section are available. A function to be executed after the document has been replaced with the compiled HTML. It does what's written in the JSONP section, without the jQuery dependency. It uses a endpoint like: http://documentup.com/username/repository?callback= to fetch the cached copy of the repository and then replaces the page's html with the generated documentation. Just like you normally would. DocumentUp also supports "Github Flavored Markdown" and we recommend you use it for syntax highlighting. It doesn't support tables as it is supported on Github, but you can use inline HTML. h1's (# in markdown) will appear as first level navigation in the sidebar while h2's (##) will appear under them as sub-navigation. Some intro text if you want. Name of your project. It'll appear in the header of the sidebar. Defaults to the repository substring of the repo option. CSS-like color representing the color for the links both in the sidebar and the content. Name of the theme to use. Refer to the themes sections. Adds a link to the sidebar for the issues tab of the repository if true. Also accepts a string if your issues are managed elsewhere. Indicate if the project is being tested by Travis-CI. If true, it'll add the small travis badge in the sidebar. Add follow buttons for one or more Twitter accounts to your sidebar. Useful to gather followers. This is your Google Analytics "UA" unique ID. Adds GA tracking to your generated documentation. The one you're looking at now. For the nostalgic. Use v1 in your theme config option. Thanks to Jean-Marc Denis for the freely downloadable bow tie I used in the logo. Versioning is going to be difficult now since this is now a service. Deployment will be continuous.